This property is in a home development that was new in 2005. After we got to the root cause of the problem, we found that the original french drain that was installed in the property owners backyard was finish graded too deep below the ground, the perforated pipe was crushed, and their was not enough gravel around the pipe to allow it to work properly......so the water just found the path of least resistance with no french drain to direct the water. This is a common problem in many new developments. French drain installation was the ultimate end all to both neighbors water problem. The Hydraway Drainage System has high flow capacity which makes it superior to traditional perforated pipe, especially during the rainy season when we can get heavy amounts of rain in short periods of time. French drain installation is necessary when excess water from a slope or improperly graded area on your property is collecting water. Many times, in new construction, home sites are cut into hillsides and the ground is disturbed potentially disrupting a natural spring which was draining into the ground. In most cases, these areas which are holding excess water is located behind the house, at the base of a slope, or between adjoining properties. 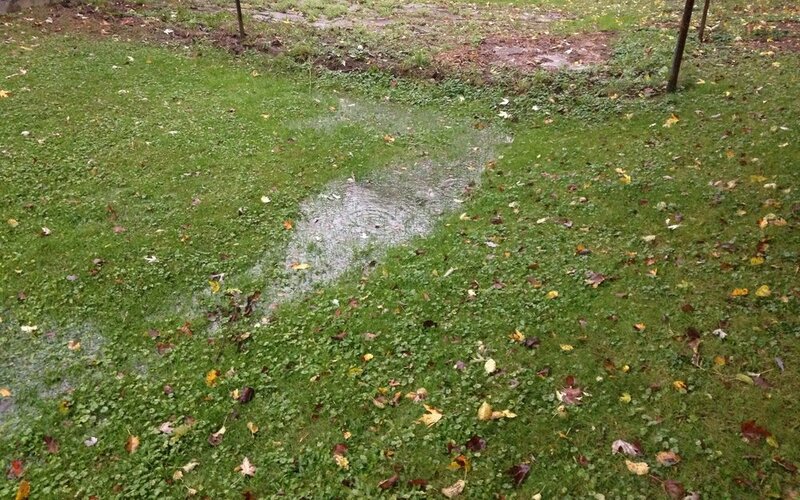 Ultimately, these wet, soggy areas on the lawn can be addressed by trenching the area and installing a french drain. A french drain is installed below the ground the consists of drain pipe, gravel and filter fabric. When we address the problematic area on your property, the first step is to determine where to drain this excess water to that will not disrupt a different part of your property. In most cases we run the drain to the street and the excess water flows to the storm drain. Occasionally the adjoining property has a drain which can be tied into and the water will drain to a culvert and then to a retention pond or storm drain. If adjoining drains do not exist and running the excess water to the street isn't an option, the french drain can be tapped into a downspout. We have seen cases where the downspout is the root cause of the water problem because the downspout is clogged. If tapping into a downspout can be avoided, it will be avoided. With that in mind, when a downspout is clogged, the water from the gutter system on your house can be channeled away with an french drain to carry the water to hillside or to the street to avoid foundation damage when water from your roof has nowhere to drain. Before any digging can take place on a property, you must contact One Call by dialing 811. Please review their website at www.pa1call.org to find more information. Once you call 811, the utilities will come to your property and place a flag to mark the utilities. This usually takes 3-5 days. Once the utilities are marked, the digging can begin. Most french drains can be completed in 1 day and will typically cost between $10-$14/lineal foot if installed by American Groundskeeping. According to Costhelper.com, French drains can cost $10-$30 a linear foot but averages about $25/foot depending on depth and width (typically 12"-24" deep and 6"-18" wide), and local rates. A French drain 30'-50' long might cost $300-$1,500, with prices averaging about $750-$1,250.